JustHost is a shared hosting provider owned and operated by their parent company, Endurance International Group. They have a single data center located in Utah, United States. JustHost is a web hosting provider owned and operated by its parent company, Endurance International Group. It has a single data center located in Utah, United States. JustHost is an affordable shared hosting solution for individuals and startups, as the entry-level shared hosting package is competitively-priced and packed with everything you need to quickly launch a website. Every plan comes with unmetered bandwidth, which was a plus point, and includes access to popular drag-and-drop website builder Weebly to help beginners get their websites up and running quickly. The plans vary mainly in the amount of disk space, hosted websites allowed, and number of email accounts. JustHost only has a single data center (located in Utah), so this may be a drawback for international customers – website loading speeds will likely be slower given the distance. However, with their one data center, their uptime rating seems decent enough – my tests yielded an average uptime of 99.97%. While they don’t have any managed WordPress hosting plans, setting up the popular Content Management System (CMS) for your website isn’t complicated. JustHost conveniently offers a one-click installation of WordPress, just as they offer the same for other popular CMSs like Drupal, Joomla!, and Tiki Wiki. You can also enable automatic core, plugin, and theme updates for WordPress via the cPanel, which is typically a value-added feature only offered in managed WordPress solutions. JustHost also includes SimpleScripts with all their hosting accounts, which enables the easy installation of a long list of popular scripts such as phpBB, form mail, social networking scripts, osCommerce, and Moodle. This will come in especially handy for those managing their own websites. They do list dedicated server and VPS hosting options, but they’re tucked away at the bottom of the webpage. This is likely because these offerings are from one of their sister companies rather than from JustHost. If you choose to upgrade to a VPS or dedicated server plan, JustHost will migrate you to the new hosting service accordingly. As a shared hosting provider, JustHost only has three plans available, all of which are competitively priced. 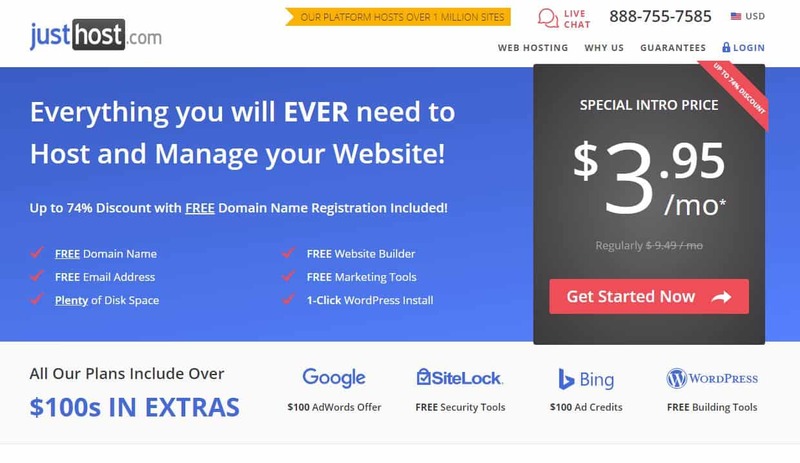 Watch out for their tricky pricing scheme, though: like many web hosting providers, JustHost lists a very low promotional rate to entice customers at first, then revert to regular prices after the initial term. JustHost offers a 30-day money back guarantee, so you can still try out their services for a bit and cancel if you decide you don’t like it. This does come with a caveat, though: if your plan came with a free domain or if you purchased any add-ons, the refund won’t cover it. JustHost offers 24/7 support in the form of a telephone hotline, email, and live chat. When I called their phone support service, I was connected with an agent in under a minute, who promptly and knowledgeably fielded my questions. Live chat was equally impressive, if not even more so: after half a minute of waiting, the live chat alerted me that I’d been connected to a support representative. He then answered the few technical questions I had regarding migrating my domain and setting up WordPress. Overall, I was pretty satisfied with their customer support. onClick="trackClickout('event', 'clickout', 'Vendor Page - Visit User Reviews', 'JustHost', this, true);"
Be Wary (even long time customers). I was a customer of Justhost for over a decade. I made no changes to my shared server in the last year or so. They kept the sites up and I kept paying. Late in October a change they made broke my sites. I contacted them and they were no help. I researched the issue, found the problem and informed them. I was told the only option I had was to upgrade to dedicated. To fix an issue they caused! I don't like to feel extorted so I asked to cancel my long time account and they acted as though they couldn't have cared less. Hostinger "the demigod for all hosting platforms" that's what I can say about it. I have become a fan of this platform due to their customer service. I've been their customer for a year. I am using VPS server and current plan as business shared hosting to develop my site. It comprises of a great customized cPanel, which made me quite comfortable when compared to other hosting providers such as godaddy, awardspace, appohosting… Definitely great experience and I certainly recommend it. JustHost’s shared hosting plans are priced lower than similar offerings from their competitors, so they may be an attractive option for individuals and businesses just starting out. However, given that they only do shared hosting, businesses anticipating much growth or larger amounts of traffic would be well-advised to look elsewhere. Wondering how JustHost stacks up against other Web Hosting companies? Enter any other Web Hosting company and we will give you a side-by-side comparison.